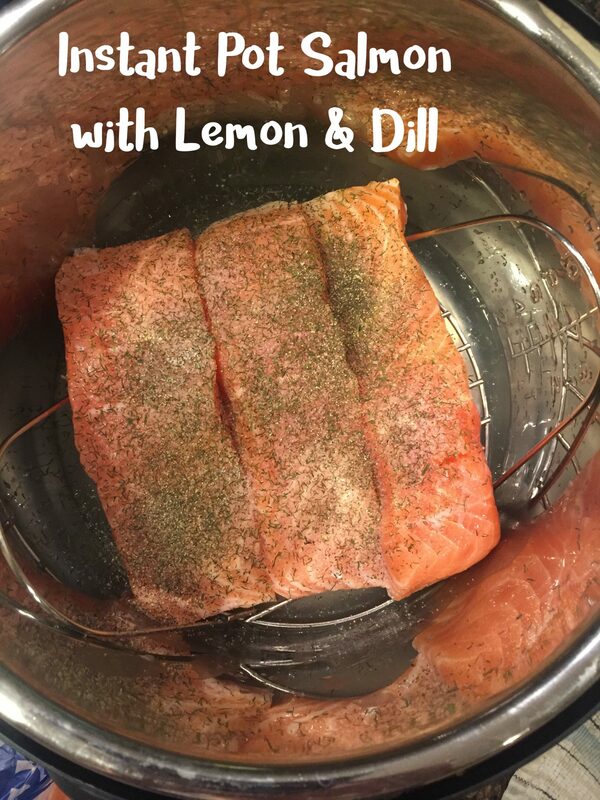 Lemon and dill are by far my favorite ingredients to use when making salmon. I’ll bake, slow cook, grill, and saute salmon with lemon and dill. I’ll use lemon slices, or lemon juice, or even lemon essential oil with olive oil. Now, I’m adding pressure cook to the list of possible ways to cook salmon with lemon and dill. And now I’m calling this my favorite way to cook salmon. The Instant Pot just does a fantastic job of cooking the salmon….so it ends up perfectly moist and tender on your dinner plate. It takes just minutes using the Steam function of the electric pressure cooker! If you’re stuck cooking the same things over and over in your Instant Pot…or your Instant Pot is stuck in the box, screaming your name, then I highly recommend that you sign up for my Electric Pressure Cooking 101 Online Class! Add 1 cup water plus 1/4 cup lemon juice to the electric pressure cooker insert. Add the steam rack. Place the salmon pieces, skin side down, on the steam rack. Season with salt and pepper. Drizzle 1 tsp lemon juice onto each salmon fillet. Sprinkle the fresh dill on top of each salmon fillet. Close the lid. Steam, Adjust to 2 minutes. Let the electric pressure cooker cook it to perfection. Cook the rice and veggies, as directed. Serve Instant Pot Salmon with Lemon & Dill with side of rice and veggies. Can you do a quick release or do you need the additional cook time? I’m confused as to the cooking time. Under the heading it states “Cooking Time – 15 minutes” and then in the directions it states “Steam, Adjust to 2 minutes.” Does that mean to steam it for 15 minutes and if that doesn’t “look” good then add 2 minutes? When pressure cooking it takes time to come to pressure and she states NPR (natural pressure release), which also takes time…these are added into the total cooking time even though the steam time is 2 minutes. Erin, in this recipe are you using fresh or frozen salmon? I’d love to be able to do this with frozen. Frozen will take at least 5-8 minutes on the steam setting. I tried a similar recipe that said to go for 5 and mine were mostly cooked with a bit raw in the middle. I think 7 minutes will probably be the sweet spot. I also did quick release of the steam, not natural cooling. It probably would have cooked fully if i waited for it to cool naturally, but I’m only interested in using the instant pot to cook salmon to speed things up significantly. Otherwise I’d just use the oven. Is the steaming under high pressure or low pressure? I tried this without adjusting anything but the time after pressing “Steam” and it came out a little overdone. I’m still new to my IP, any tips? It was delicious otherwise! The flavor was spot on. This calls for natural release if you do the quick release that should keep it from being too firm or overcooked.